Far from being a newly discovered paradise, Phuket has been constantly inhabited for over 2100 years. The first settlers were tribes from Thai’s inland mountain region; however, there is evidence of the region being visited by sea traders as much as 1000 years earlier. The new settlers thrived as trade with vessels originating in China, India and Europe brought valuable items such as pearls, precious stones, timber and others to and from the area over the following centuries. Like many other trading hubs, Phuket has absorbed migrants from many of its economic partners. These newcomers have brought their own history and culture with them and left an indelible impression on the local flavor. This is never more evident than in the central area of the Old Town, where architectural influences from China and Portugal blend seamlessly with the local Thai aesthetic to create a truly unique look and feel. Well, not the type that you find in Europe, however, the nomadic Chao Le people, colloquially known as “Sea Gypsies”, have long called the area around Phuket one of their homes. Characterized by their distinctive “longtail” seafaring vessels and with their own unique language, animistic religion, and culture, this fascinating community of only 2000-3000 people add intense color and mystique to an already diverse human landscape. While there is a significant Muslim minority, about 95% of the local population subscribe to the Buddhist faith. 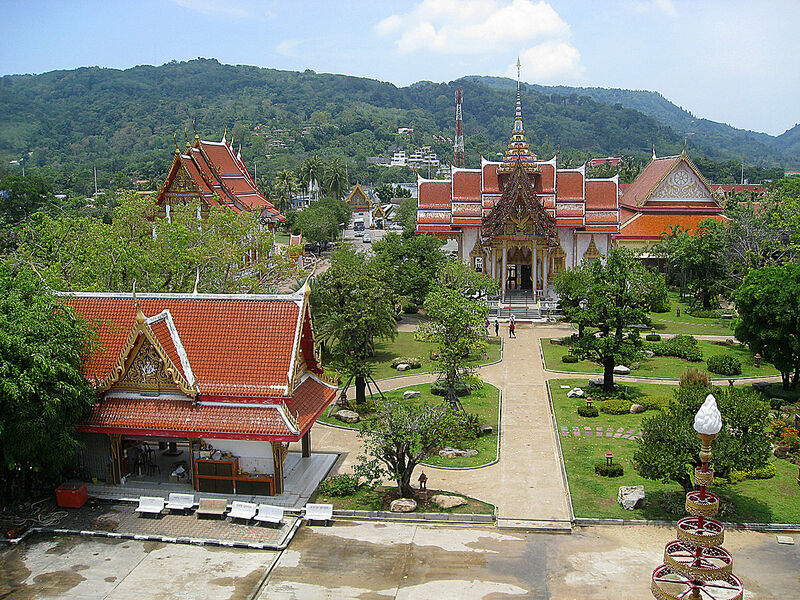 There are over 30 stunning Buddhist temples in the area, none more impressive than Wat Chalong. Covered in gold in the classic, opulent Thai style, this religious marvel is a must see for any visitor and offers a stark counterpoint to the sun and surf. The enigmatic Wat Pra Thong is another temple not far from the bustle of Phuket; however, this one has a strange and intriguing story. Legend has it that a young, local boy tragically lost his life while trying to remove a piece of shining metal that he had found on the ground at that very spot. His grieving father was soon after visited by the boy’s spirit, who informed him of the location and encouraged him to look into it himself. The father did so and found that the piece of metal was, in fact, the tip of a great golden Buddha buried below the earth. Today, the statue remains half buried, with a beautiful temple constructed over it and locals still believe that a curse will befall anyone who attempts to uncover it. While it is unclear whether this is the original statue of the story, or even whether the story itself is true, Wat Pra Thong should be included on the itinerary of any interested traveler. Thai food is simply outstanding, and Phuket has some of the best on offer. The region’s multi-cultural roots mean that in addition to the traditional Thai fare, Chinese, European and other influences are blended in to create a wide selection and fusion of flavors. With all this to offer, you will not regret visiting Phuket, which is of the best beach destinations in Asia. If you feel like a break from the hard life of lounging on the beach sipping daiquiris, you can rest assured that there is a fascinating world of excitement right at your fingertips.